Wastewater discharged from the Ben Lomond Waste Water Treatment Plant is now subject to water quality and biological monitoring of its receiving water, the upper alpine reaches of the Ford River, under its Ambient Water Quality Monitoring Program as required by the Tasmanian EPA. The Ford River rises at 1435 m elevation and flows through a large periglacial dolerite boulder field in a shallow depression before dropping off the Ben Lomond plateau at around 1300 m. It is a clearwater, low ionic strength alpine stream with a shallow, diffuse, sometimes subsurface channel. The Ben Lomond development discharges wastewater via a single pipe outfall into a side channel of the Ford River at approx. 1 km from the commencement of the surface stream channel. 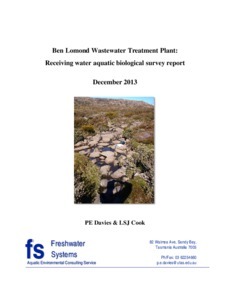 This report presents the results of aquatic biological sampling in spring 2013.